Blanchard's memoirs of the Union Army as they marched the Old Port Gibson Road toward Raymond, stopping at Hankinson's Ferry, Rocky Springs, and Utica. Our movements now were rapid, the roads good, and the weather a little cooler. We moved by three roads. The 17th Corps on the extreme right, with Logan's Third Div. in the lead. We found little time to eat, much less to sleep, but were pushed forward before we had time to make a little coffee in the morning; or should we stretch out on the ground at night we had to sleep with one eye open, as the command might be "forward" at any moment. We were moving along quite rapidly one moonlight night, when one of our boys saw something rolled up in a blanket in the corner of the fence. Wishing to have a little fun, he dodged out of the ranks and giving the bundle a kick exclaimed, "Hello, old fellow! Where did you get your whiskey?" At that time some one shied up and said "Look out, that's General Sherman!" The soldier flew back to the ranks in an instant, and was careful how he kicked the next man before he knew who he was. On the 9th of May [12th of May] we came up with the enemy at Raymond, a city of about 10,000 inhabitants [less than 1,000], to the southwest of Jackson about 25 miles [10 miles]. Our Third Division was deployed across the main road leading to the town, and stretched across a large cotton field over which we moved down into some timber which grew along a stream which was then nearly dry. Some batteries were planted on either side of the road and began shelling the timber before our arrival, to which the "Rebs" replied with spirit with their guns on the opposite side of the timber near the town. We rested on our arms in the edge of the timber for a short time while our scouts reconnoitered their position. Some of their cavalry appeared on our right, but a few bullets hastily drove them back. Then came the "Rebel Yell" the timber was swarming with them. Then they rushed forward on a charge, and our lines met them bravely, not yielding an inch, I could see a line of continuous fire but a few feet in front of us in the timber. The battle was now fierce. Almost hand to hand so close were they, that some of our boys fixed their bayonets ready to stab them. Both lines stood equally firm; both equally determined as a couple of bull dogs engaged in a death struggle: The air was hissing bullets; they cup up the ground and made the dust fly in our rear as though a heavy shower of hail was falling. 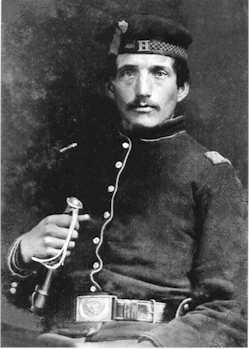 General Logan at the opening of the battle had donned a cloak to conceal his rank, rode along the lines shouting to those who would fall back "For God's sake men, don't disgrace your country; see how they 're holding them!" Robert Darrow dropped his gun and crawled behind a tree, and where I remonstrated he said, "Oh Sergeant, I'll soon be a dead man." He was shot through the lung, and before the battle was over, a cannon ball struck the poor fellow on the knee and he soon died. Our boys were suffering so badly that they crouched down to the ground to avoid the flying missiles of death which filled the air; loading and firing as rapidly as possible on the knee, and 'twas in this position that our Captain Victor H. Stevens was shot in the head and instantly killed. For two hours this deadly conflict lasted, neither party gaining ground but continuously losing the life blood of their men. Our regiment was suffering severely, but there was no thought of giving up. Seeing the hard time our boys were having on account of our exposed position Colonel Richards ordered the boys to jump over a rail fence which was a few feet to our rear, that the rails might be a little protection against the bullets; but in executing this move, a number of the boys were shot and among the number was our own Colonel Richards, who was instantly killed. While this sanguinary conflict was going on, General McPherson had formed the balance of his Corps in line of battle and planted his cannon on a ridge half a mile to our rear, expecting that our Division would be driven back every moment. But as two hours had passed and we still held on, he sent the 18th Wisconsin to our relief. 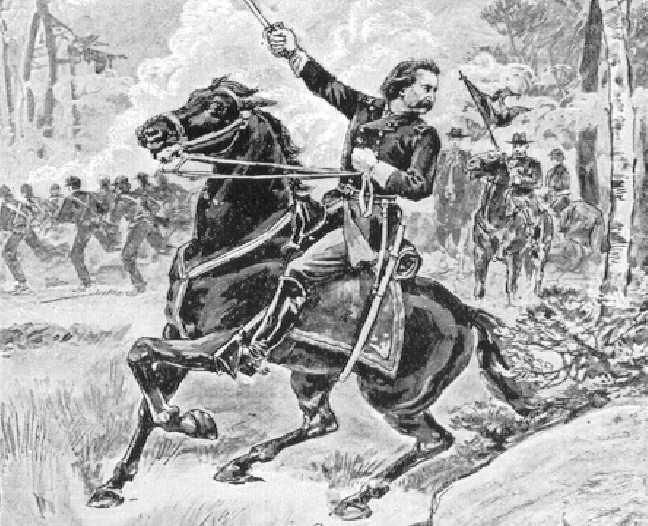 As soon as the fresh troops came up we doubled our lines, fixed our bayonets and going forward with a yell we soon swept the field, the enemy retreating through their town on the "double quick" and made off in the direction of Jackson, our cavalry in hot pursuit. This was the severest fighting we had seen thus far, and although not a general engagement and scarcely mentioned in history; yet seldom in any engagement was the loss greater in proportion to the numbers than on that bloody field at Raymond. I passed over the field after the firing had ceased, and the dead were strewn thickly over a space of about ten acres; behind every tree, in every hollow, or behind every log, some poor fellow had crawled away and died. The "rebs" had gone and left their wounded in their haste and their moans filled the air as they lay uncared for in the field. One poor fellow called feebly to me as I passed along - he was lying on his back with a bullet hole through his breast - and says, "Sergeant, do you think I'll die?" I told him I hoped he would not, gave him a drink from my canteen and hurried on; as our troops were moving. We encamped in a graveyard that night, upon a hill near the town. Rather a gloomy place, yet we saw no ghosts but slept soundly. The next day we moved on in the direction of Jackson. Rain came on and continued during the afternoon and all night. We had no shelter and to lie on ground with the water underneath and the rain pouring down on us, was not so pleasant. I found a good corner of the fence, put two rails across, then stretched myself on the rails and covering myself with a rubber blanket, and said to myself, "let it rain, who cares," and in this position I slept soundly all night.